Based in Dursley, Gloucestershire. With a BSc (Hons) Psychology and interests in visual and cognitive impairments. Three Sloes creates responsive and accessible websites suitable for small charities, organisations, individuals and groups. Sweet jellies and wholesome cake. 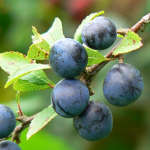 The name three sloes came to me while picking sloes one autumn evening. Just a rhyming couplet I made up, which stuck in my head.